This is our last installment before the actual eclipse. We’re less than 24 hours away from the event and we’re just wrapping up the finishing touches, doing one last test. As expected, the Panasonic AW-360C10 arrived on Sunday. We had learned a lot about the camera over the previous 48 hours and were ready to go once it arrived. 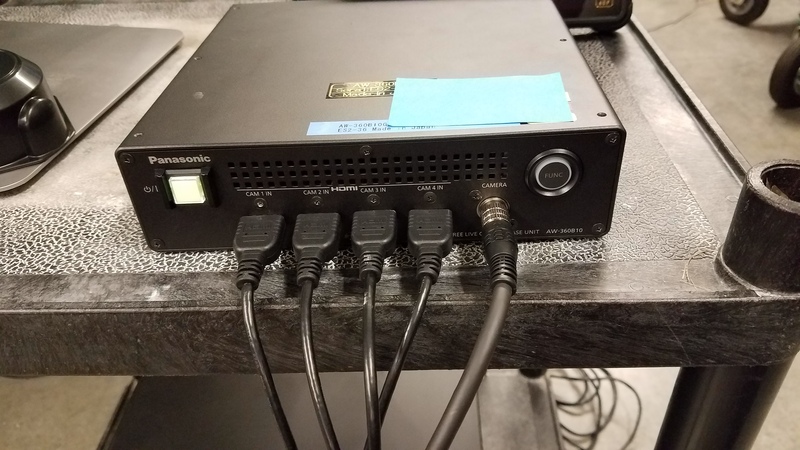 The camera has one power connector that plugs into the base AW-360B10, as well as 4 unusual looking cables that appear to be mini-USB to HDMI with the 4 USB connector plugging into the camera and the 4 HDMI connectors plugging into the base. Recording is done externally. 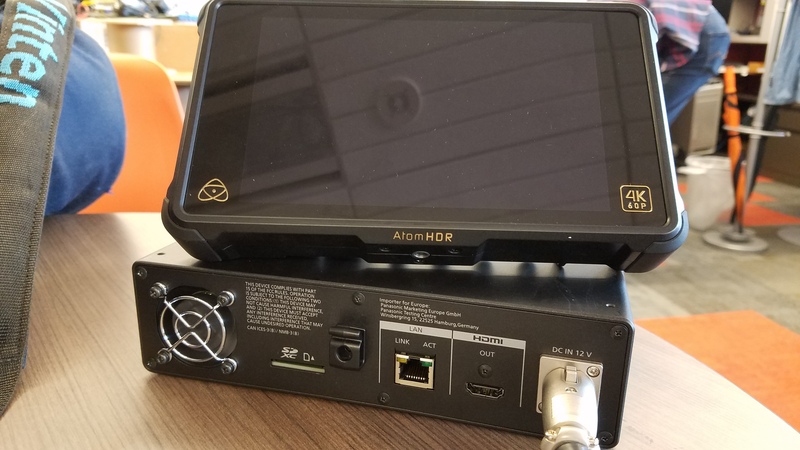 In our case we’re using an Atomos Shogun Inferno using a standard HDMI-out connector from the base to the HDMI-in on the Atomos. Finally, we run an SDI cable from the Atomos to our encoder. Here’s where things got complicated. Our encoder is an Elemental Live with 3G-SDI in. That caps out at 1080p. 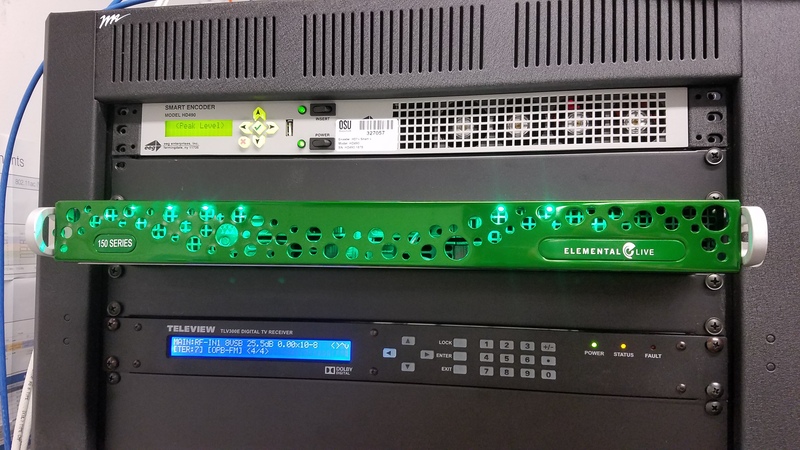 While the Panasonic equipment can produce a 4K picture, our encoder cannot. The Atomos can downres the 4K picture to 1080p easily. And the Elemental Live is rock solid. Unlike our hit-or-miss testing with the Allie software running on a Windows 10 laptop, we knew every time we hit “start” on the Elemental Live, we would get a live stream that would run as long as we wanted it to. But while the Allie+laptop combination could produce a 4K picture, the Elemental Live+Atomos combination could only produce a 1080p picture. Our solution? Do both! Ultimately, we’ll only know on Monday just how well each workflow progresses and how good of a picture each produces. But, unlike the Allie which only records on YouTube, the Panasonic is recording everything in 4K locally on the Atomos. The Atomos uses 3.5″ SSD hard drives that can be easily ejected and put into an SSD-to-USB dock, so transferring the recording after the fact shouldn’t be difficult. The live stream begins at 9 a.m. Pacific Time. Watch it on OSU Live. Posted in 360, Eclipse, Live Streaming, OSU Live, YouTube. The view from the rooftop showing the exact spot we will be placing the 360 camera. The roof of Weatherford Hall can be see on the left and you can barely see the roof of Austin Hall on the right. In the distance is Reser Stadium, and the green field before it is Student Legacy Park where the University’s Eclipse Festival will happen. Access to the rooftop is restricted and must be managed carefully. A whole team has been working on this project, which includes videographers and engineers. Having the vision to do this is one thing. Implementing it is another thing entirely. The team has been working tirelessly to set up equipment and run the necessary cabling to the rooftop to make this possible. The rooftop already has power outlets, but network ports and – as it turns out – coaxial cable were also necessary. Our Allie streaming rig. 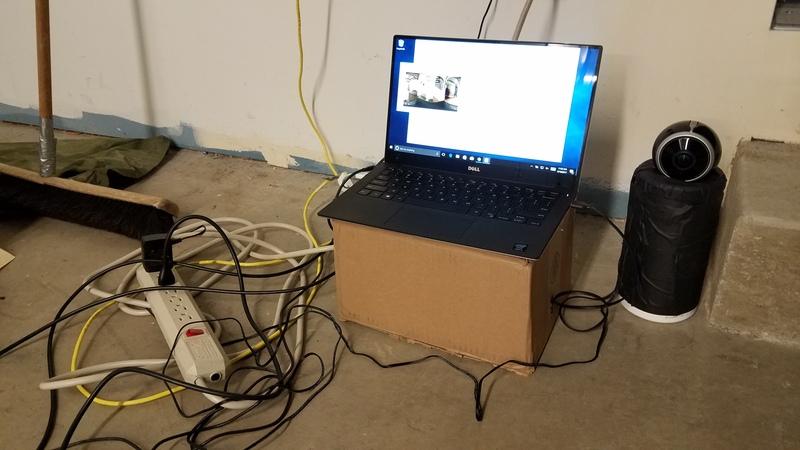 A Dell XPS13 laptop running Windows 10 and the Allie camera with our homebrew mount (a Clorox tub wrapped in tape). Everything would be run from a utility room on the roof, through conduit, to the server room immediately below. Our testing was being done in the server room so moving things upstairs to the utility room meant nothing would change other than we’d be 20 feet further down an Ethernet cable. Our testing also gave us an opportunity to see how long it would take us to set up. We’d done the testing so often now that in 20 minutes we were ready to start streaming. Come the morning of the 21st, wearing a harness, tethered to a safety line, and under close supervision, we would move everything out to the edge of the rooftop, secure everything with tie-downs, and being our stream. And then a new opportunity presented itself: a new 4K capable 360 camera not yet on the market would be arriving on the day before the eclipse. The Panasonic AW-360C10 (and it’s companion AW-360B10 base) is a high end professional 4K 360-degree system. But could we get it set up and running in time? The Allie camera from IC Real Tech is certainly a strange beast. I think it can best be described as a camera for security and monitoring. While not designed for outdoor use, I can see it being set up in your home for your security system or to keep an eye on your baby. It’s designed to work 24/7 and carries night-vision capabilities in addition to the much desired 360° functionality that we’re seeking. Resolution is 2048×2048 so to call it 4K would be a stretch, and yet that’s exactly what IC Real Tech says it is. To expect that the Allie would behave like a regular webcam would be a mistake. Before you can do anything with the Allie, you must register it. Register it means creating an Allie account and, optionally, signing up for their cloud recording service. Registering a device whose only network connectivity is through wifi can be simple or it can be incredibly complex. For simple, I refer you to something like the Google Chromecast. For complex, I refer you to the Allie. The Allie can be set up wirelessly through an iOS or Android mobile app, or via USB on MacOS or Windows. In the latter case, you have to install the provided software. The Allie, interestingly, seems to run Android and so on Windows requires special Android drivers, but that didn’t pose a problem. Once the drivers were set up, on both MacOS and Windows, a folder appeared from the device providing you with the necessary software. It should be noted that it’s unlikely that this software will be the latest version and you will have to update. Updating your software on MacOS meant using the App Store and also meant updating the Mac computer to the latest version of MacOS. After creating your Allie account, the software tries to get the camera onto your wifi network. But doing this on a wifi network that requires secondary authentication (like a corporate network, a hotel, or even Starbucks or McDonald’s) is nearly impossible. To get around this, we had to create a wifi hotspot with a mobile device and even then the Allie had difficulty finding the right wifi network, often times showing the same network multiple times, but not the one we wanted. Once we got around this issue, we were able to explore the mobile apps fully. The mobile apps allow you to modify the camera’s settings, including the night-vision functionality, which have some very fine grained settings which may confound those unfamiliar with such parameters. A simple on/off toggle for night-vision is not apparent, though. But you can switch it to manual, which basically does the same thing. The Allie also has a microphone which you can disable through this interface, as well as a speaker. In addition to the standard AC cable that powers the camera, the Allie also comes with a USB cord which allows you to connect the camera to a Windows or MacOS computer. The USB cord seems expressly designed for the camera’s streaming functionality, as it cannot be made to stream through the mobile apps, only through the MacOS and Windows apps. If should be noted that we were never fully successful in getting the MacOS software to control the camera properly. We tried numerous versions and each would stall a different points. The Windows software behaved better. 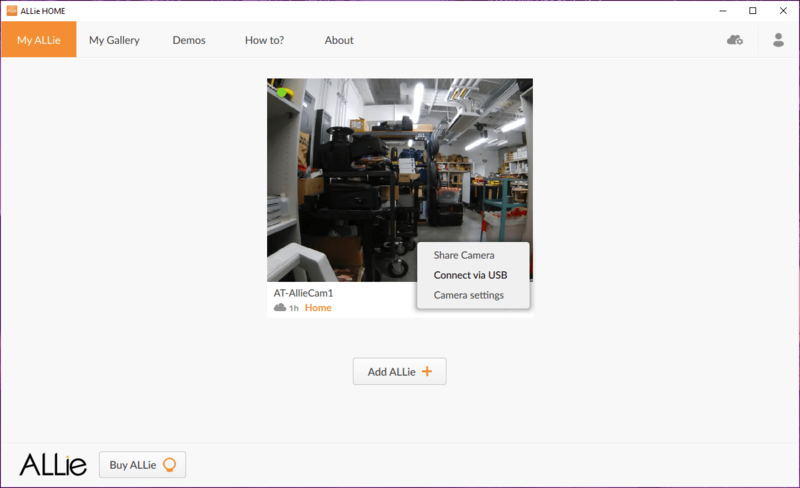 Upon opening the software and logging into your Allie account, the software will find the camera that’s been associated to that account. This is basically your surveillance panel. 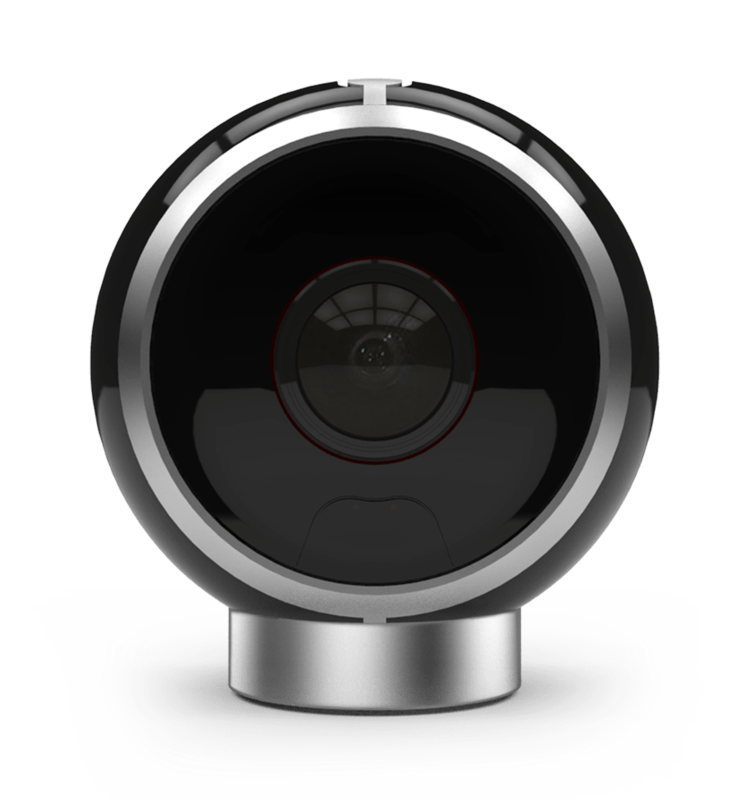 If you’re using it for home security, you can login here and see what’s going on in your home from a remote location, listen to what’s happening, and address people through the camera. But there’s also a “Connect via USB” option. Doing so opens up a streaming interface. The latest version of the software gives us streaming options for both YouTube and RTMP streaming. Choosing YouTube will prompt you to sign in with your Google account, at which point a YouTube live streaming event will be created. RTMP can be used with YouTube as well if you want to just reuse the same event every time (rather than creating a new one each time you click the button) or with Facebook, which also supports RTMP and 360 streaming. The “ALLie HOME” software interface. Immediately upon starting to stream, the software gives us an error indicating “Not enough performance”, but it won’t hamper your stream. It’s not clear what causes this error since the CPU and RAM usage on the computer in question is not at 100% so the machine is not being maxed out. YouTube is content to stream your live video in 360 and allows the viewer to select up to 4K resolution. Stability of the stream is hit-or-miss. We’ve been able to stream for 4+ hours but there have also been times when the software crashed after only a few minutes. Consistency is important in this project as the eclipse is once-in-a-lifetime and we don’t need the system to crash in the middle of the event. Overall, the Allie camera has exceeded beyond expectations. We’re clearly using it “off label” and it’s incredibly affordable. While we would have preferred some things about this camera to have functioned differently, it’s more than capable of delivering a high resolution (higher than HD but probably not 4K) 360 video. The night-vision functionality is certainly a great bonus, although having to run the stream through an encoder rather than being able to physically network the camera itself means you probably won’t be able to stream 24/7 like some webcams. For our needs, i.e. the eclipse, the Allie may just do the job. Posted in 360, Eclipse, Live Streaming, YouTube. Delivering video on the web generally bifurcates into two realms: synchronous and asynchronous, also sometimes called live and on-demand. By and large, when you’re watching video online, you’re watching asynchronous or on-demand video. This is video that was previously recorded and then uploaded for you to watch at your leisure, be it a vlog on YouTube or a movie on Netflix. Synchronous video, which we will call live video for the sake of brevity, requires an entirely separate and complex set of processes in order to make happen. But with the growing popularity of live video, it’s becoming easier to do. Platforms for live streaming have existed to some degree for years but the complexity of it made them costly and kept it out of reach of most people. This was often compounded by the need to use Flash for live streaming, long after most on-demand video had moved to simpler HTML5 video delivery. Fortunately, YouTube implemented live streaming on their platform some years ago, and Facebook followed suit shortly thereafter. This vastly simplified the delivery of live video and opened it to the masses. 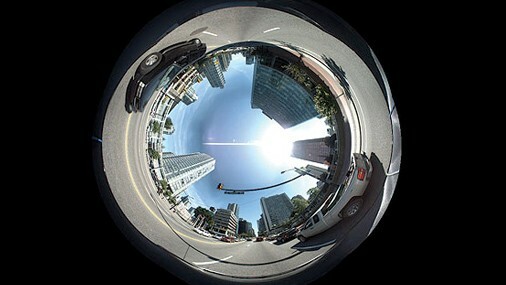 The next horizon in live video, though, recently became the live streaming of 360 video. 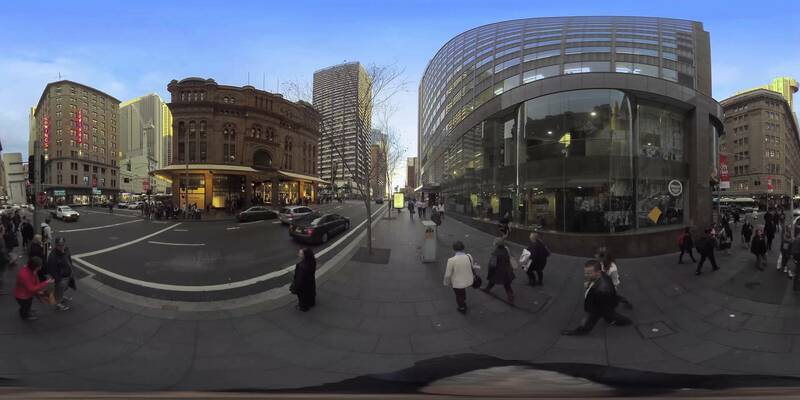 This is completely spherical video which allows the video to “look around” a venue, either by clicking and dragging on the video window, moving around their mobile device, or through the use of VR goggles. As with the advent of live streaming in the past, the advent of 360 live streaming introduced a new layer of complexity. You need a number of elements for 360 live streaming that different from regular live streaming. For instance, you need a platform that will deliver 360 video properly and until recently that was limited to YouTube alone, although Facebook has recently joined the market. You also need special equipment. This can be a camera with two – or more – lenses pointed in opposite directions, or an array of cameras mounted in spherical fashion. And you need software than can interpret this type of video and deliver it to your platform of choice. For about a year now, the barebones entry-level option for live streaming in 360 was a Ricoh Theta S camera (which you can purchase for about $200), plugged into a computer running Open Broadcast Software, which then connects to YouTube for streaming. The weak link in this setup is the Theta S which, while technically a HD camera, processes 360 video very poorly. Furthermore, all 360 streaming platforms (namely, YouTube and Facebook) further degrade image quality as they deliver your video. If you want to stream anything more than a blurry image, you need to step up to a 4K 360 camera. Here’s where things get complicated. While many cameras will record 4K 360 video, the trick is to find something that will live stream it as well. And while some will live stream, most of these are designed to be operated over a smartphone which means you can’t really expect a constant, reliable, high image quality. We’re seeking a 4K 360 camera that can live stream and will do so either connected to a network over Ethernet, or connected (via USB, HDMI, etc.) to a computer which is itself connected to a network over Ethernet. 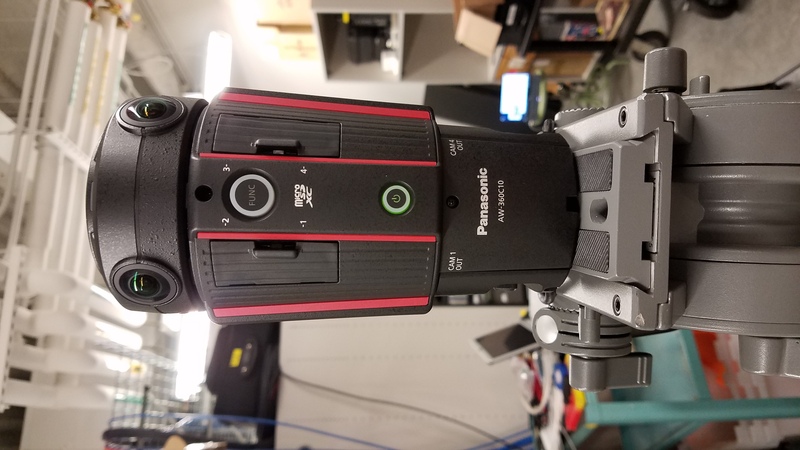 High end production units such as the Nokia OZO, Insta360 Pro, Orah, or Z CAM S1 sell for thousands – or tens-of-thousands – of dollars and are simply non-starters despite probably being better suited to our needs than most low cost consumer options. Nikon KeyMission 360: This is an action camera in the same vein as a GoPro. It’s shock proof and includes image stabilization. It can do 4K recording but it’s unclear if you can connect it directly to a computer nor is it clear that you can live stream from it. It can be purchased for about $500. Kodak PIXPRO SP360 4K Dual Pro Pack VR Camera: To be clear, this is a bundle with two cameras mounted together with a special bracket and synced through a special remote control. It seems intentionally designed to be as complex as possible, with no indication that it can stream live video. The price, at over $600, indicates that you’re buying 2 cameras in this bundle. Garmin Virb 360: As with the previous cameras on this list, the Garmin – best known for making GPS devices – is a blocky action camera probably not suited for live streaming. It carries weird specs such as “5.7K/30fps unstitched and 4K/30fps with in-camera stitching”. Nonsense like that doesn’t help. On the bright side, it *CAN* live stream, but only from iOS devices. At nearly $800, it relies heavily on bells and whistles such as the enhanced unstitched resolution, image stabilization, and voice controls. Samsung Gear 360: The latest version of the Samsung Gear is 4K capable. It can stream, but only at 2K resolution and only via a Samsung Galaxy phone. You can currently buy it for under $200. 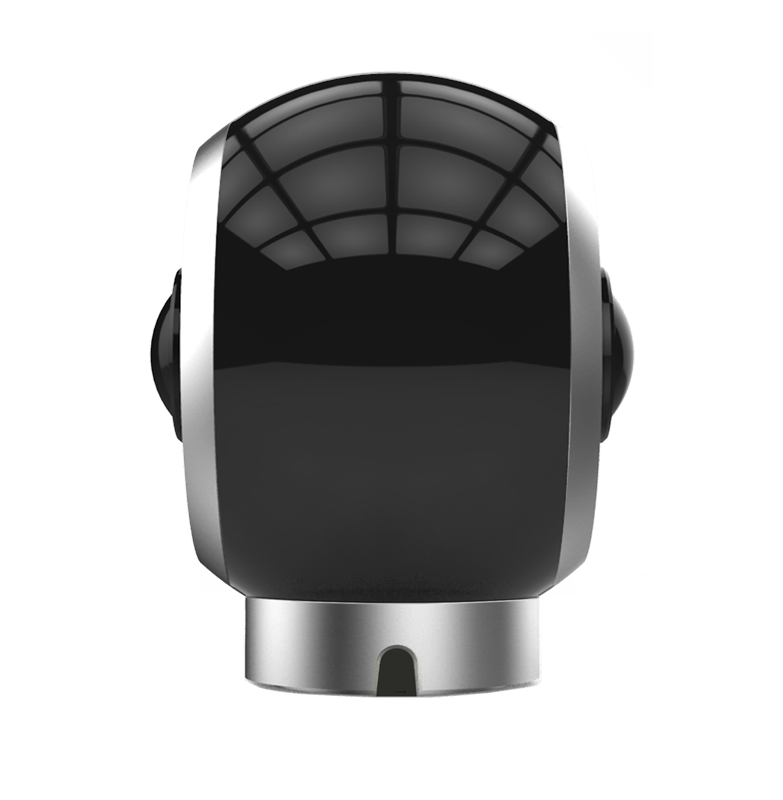 IC Real Tech ALLie: Designed more as a security and surveillance camera, it’s clear that the ALLie can stream from both iOS and Android devices and, after some investigation, we discovered it could also stream from MacOS and Windows. Its claims to being 4K capable are questionable but when dealing with spherical video, the old norms (HD = 1920×1080, 4K = 3840×2160) go out the window. This camera alleges it can stream “2048×2048” at 20fps. Not the best resolutions of the cameras listed, but it seems – at least – very confident that it can stream live video. And it’s about $100. Clearly, for $100, the ALLie wasn’t much of a gamble so we committed to testing this camera to see what it could do. More on the ALLie in our next installment. We’ve been gearing up for this eclipse for a long time. While some may be coming to the realization that there’s an impending eclipse a little late to the game, we’ve been exploring our options since 2016. Very few groups on campus (or nationally, frankly) are as well positioned as we are to make a show of this, and do it right. I’ve spoken to some YouTube science communicators in the past few months about their plans. A number of them are planning to travel to areas directly in the path of the eclipse with nebulous plans for live streaming the event. What, I believe, many are not considering is the impact to infrastructure from so many people traveling to such a small area. FiveThirtyEight has explored the demographic impacts of such a massive, compressed population shift. 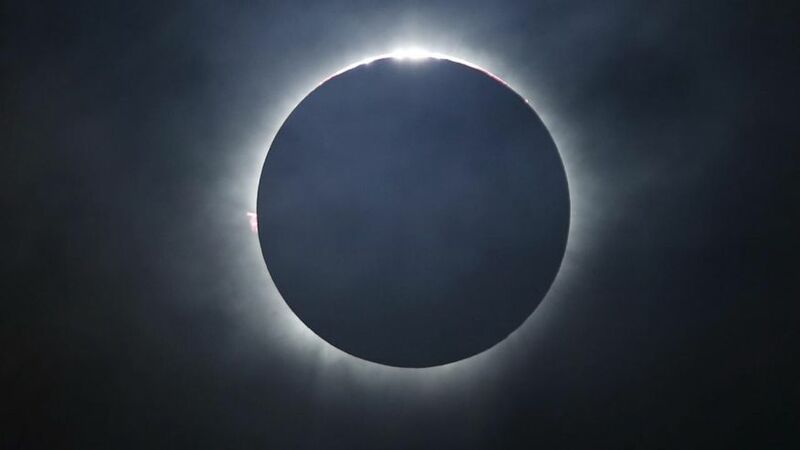 The Eugene Register-Guard writes about the “Eclipse apocalypse” while authorities in Lincoln City are cautioning people that “You might have to stay at your home for 3 or 4 days, have your supplies ahead of time, if not longer.” Cellular service is likely to be non-existent. Holding up your iPhone to live stream the eclipse is a non-starter. 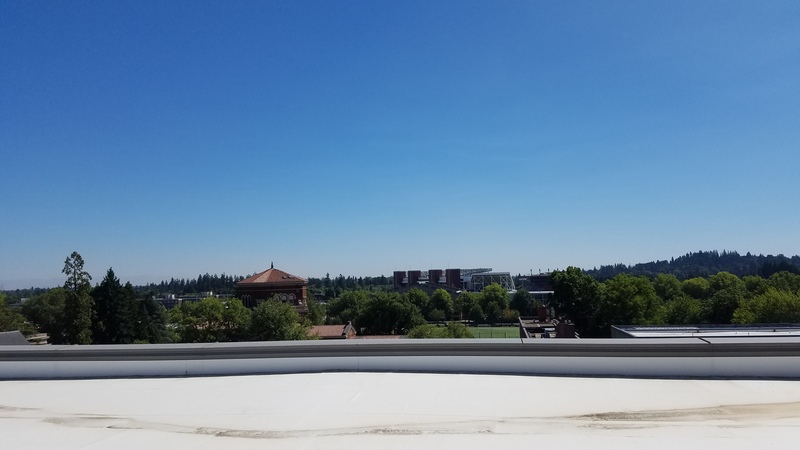 Corvallis, Oregon, home to Oregon State University, is one of the most opportune spots for eclipse watching, with one of the lowest likelihoods of clouds. Oregon State University is inviting thousands to come and participate in the OSU150 Space Grant Festival. The campus is likely to be crowded with eclipse tourists and classes have been canceled for the day. This may put unprecedented loads on the campus network. First and foremost, Oregon State University has an array of live streaming webcams all across campus. These are full framerate, high bitrate, high resolution webcams, wired to the campus network (no wi-fi involved). That alone should make for a spectacular show as you watch the moon’s shadow as it crosses in front of the sun, starting at 9:04 am, reaching totality at 10:17 am, on August 21st. Furthermore, a number of research universities spanning the nation, from Oregon to South Carolina, are collaborating on the Eclipse Ballooning Project, where high altitude balloons with cameras attached will be launched from coast to coast to live stream the experience via the NASA Channel. Oregon State University is collaborating with Linn-Benton Community College on this project, kicking off the show by launching a balloon from an OSU research vessel in the Pacific Ocean. Lastly, we come to the Learning Innovation Center at Oregon State University, one of the newest and most technologically advanced buildings on campus. It happens to be one of the tallest buildings on campus and we happen to occupy the top floor of this building. With access to the roof, and having undertaken the proper safety precautions, we are preparing to outfit the rooftop with an array of high end professional video cameras with the intention of recording multiple aspects of this event. A panoramic view from our rooftop looking southward. The sun will travel from left to right. We have a spectacular view of campus from our rooftop. So beyond simply recording this event and relying on our regular array of cameras to live stream the eclipse, we’re going to be taking this one step further, by live streaming the eclipse from the rooftop of the Learning Innovation Center using a 4K 360° camera. We’ll talk about our evaluation process for selecting a 360° camera for this project in our next entry.